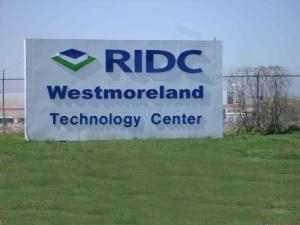 As part of the attraction and growth of a regional employment center located near New Stanton, RIDC Westmoreland (former site of Sony Technology Center) is one of Westmoreland County's newest redevelopment projects. The building, containing a total of 2.8 million square feet and situated on approximately 330 acres of property, has been transitioned into a multi-tenant environment that can serve a multitude of uses, such as industrial, manufacturing, natural gas supply chain, agricultural, educational, research and development, as well as computer operation-type centers, etc. The significant leasable areas in the facility include 50,000 square feet - 1,000,000 square feet of overall contiguous flex / manufacturing space and two floors, totaling 96,000 square feet, of office / administrative space. In addition to available building space, the site also offers available property (i.e., rail oriented development areas for new construction). The rail spur that goes into the facility links in with the Southwest Pennsylvania Railroad's mainline. Take the main line North and it links in with the SWP Conrail/Norfolk Southern mainline near Greensburg. Take the SWP south and it hooks up with the CSX mainline near Connellsville. These connections will take freight all across the continent - to all points North (as far East as Halifax and as far West as Vancouver) via the Canadian National Railroad. The CN-IC Railroad can carry freight all the way down to the gulf in New Orleans making this location extremely valuable especially with the amount of natural gas being produced in Pennsylvania right now. View the rail maps, marketing packet, or maps below for more details!